The relationship between dogs and humans is something special in nature. Cats or horses may be next in line, but it's not quite the same. Horses can't cuddle or hop up on the sofa, and cats are way too independent. Even apes and monkeys, our closest genetic relatives, with the possible exception of Mighty Joe Young, don't come close. Behavioral scientists may break down the phenomenon known as domestication as a natural evolutionary process, but that doesn't completely account for our emotional attachment. At least in Western culture, everyone loves their dog. But the bond between blind people and their guide dogs, one that can be traced as far back as ancient Rome, is unimaginable to the rest of us. A German shepherd trys out RuffWear Grip Trex boots that will protect his feet from hot surfaces in the summer and cold, snowy ones in the winter. 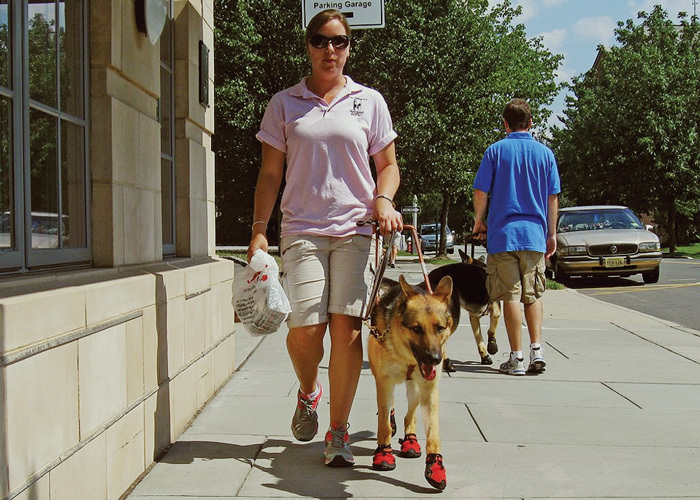 All Seeing Eye dogs leave campus with a full kit of gear, including a set of booties. Statue of Morris Frank, and founder of The Seeing Eye, and his guide dog, Buddy, on the Morristown Green. Domestic dogs separated from their wild wolf cousins many thousands of years ago, and began their association with humans when men and women were still foraging the forests for roots and berries. Dogs made themselves useful during prehistoric hunting expeditions, and as humans graduated to more efficient agricultural societies, dogs assumed prominent positions in service to their two-legged brethren. Men began to sort dogs according to their abilities, and one special group eventually became indispensable for sheepherders around the world. Herding dogs had somehow been persuaded to ignore their natural impulse to hunt and kill sheep or cattle, taking the ironic role of protecting their charge from attack by their untamed canine relatives. By the 1800s, shepherds had fine-tuned generations of dogs by selective breeding for intelligence, speed, strength, and keen sense of smell. In Germany, breeders thought it would be a good idea to somehow standardize dog breeds so that they could become even more proficient. They went from village to village picking and choosing from dogs that were the best at their jobs, but looked entirely different from one another. In 1899, after a few more generations of refinement, a dog named Horand was declared the first German Shepherd. In 1923, Dorothy Eustis moved from America to Switzerland with her new husband, and began breeding German Shepherds as police dogs and for work with the Red Cross. She had heard about earlier attempts to train dogs as guides for visually impaired German veterans of World War I. In 1927, while she considered ways to develop her own program along with trainer, Jack Humphrey, Eustis wrote an article, published in the Saturday Evening Post magazine, that chronicled promising efforts in Potsdam to teach dogs to help former soldiers blinded by mustard gas. Her narrative concluded, "The future for all blind men can be the same, however blinded. No longer dependent on a member of the family, a friend or a paid attendant, the blind can once more take up their normal lives as nearly as possible where they left them off, and each can begin or go back to a wage-earning occupation, secure in the knowledge that he can get to and from his work safely and without cost; that crowds and traffic have no longer any terrors for him and that his evenings can be spent among friends without responsibility or burden to them; and last, but far from least, that long, healthful walks are now possible to exercise off the unhealthy fat of inactivity and so keep the body strong and fit. Gentlemen, again without reservation, I give you the shepherd dog." Morris Frank and Buddy cross the street in Vevey, Switzerland in 1928, shortly after they met at Dorothy Eustis' training facility. 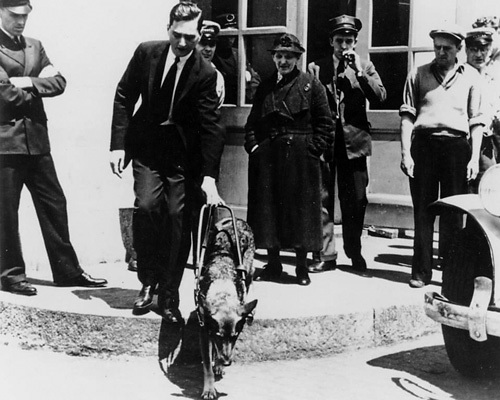 Morris confidently steps off the curb as amazed onlookers watch, most likely the first people to a observe a dog trained to provide a service for a person. That fall, in Nashville, Tennessee, a father read the story to his nineteen-year-old son who had lost one eye in an early boyhood accident, and his second during a boxing match when he was sixteen. The young man, whose name was Morris Frank, immediately wrote to Ms. Eustis, and it was his letter among thousands of replies that she chose to pursue. "Is what you say really true?'' Morris wrote. "If so, I want one of those dogs! And I am not alone." Frank eagerly accepted Dorothy's invitation to visit her school and sailed for Europe, where he was introduced to a beautiful female German shepherd whose name he changed from Kiss to Buddy. Frank and his new companion trained for five weeks and were soon able to negotiate the twists and turns of the Swiss alpine village of Vevey, the man holding tightly to Buddy's harness, "seeing" by way of the dog's cues. The first class to graduate from The Seeing Eye in Whippany, with chief instructor Jack Humphrey on the left. Today's students use their foot, rather than canes to feel the environment. Morris Frank returned to America as partner to Eustis's ambition to spread the word about guide dogs in a campaign that was entirely successful. After reporters watched Frank and Buddy traverse a busy New York City street, it was not long until Dorothy Eustis felt sufficiently confident to return to the United States to found and finance a guide dog school with Jack Humphrey and Morris Frank. On January 29, 1929, The Seeing Eye was incorporated in Nashville, but because the sultry summers there were not conducive for training dogs, the organization relocated to Whippany, NJ, in 1931, where Eustis purchased a ten-bedroom mansion with enough room to house students while they learned the ways of their dogs. 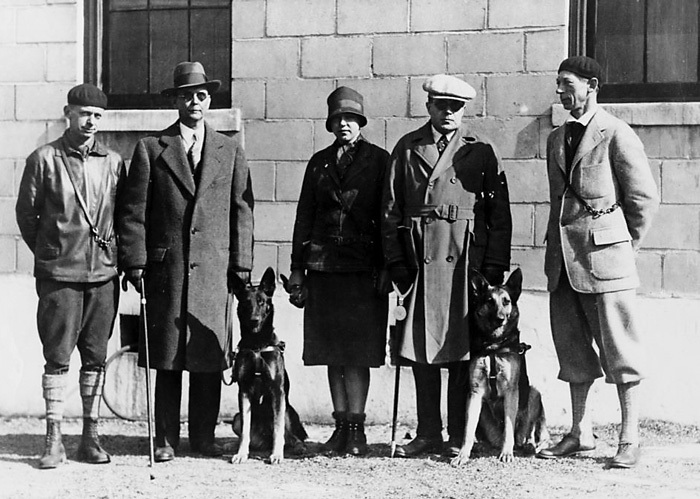 Morris Frank and Buddy traveled throughout the nation to publicize the school—received by presidents Coolidge and Hoover—and to shape policies and procedures that accepted guide dogs in public places. When Buddy died in 1938, she was hailed as a national heroine. By that year, The Seeing Eye had trained 350 guide dogs. Dorothy Eustis retired as President of the Seeing Eye in 1940, but Morris Frank, with a succession of guide dogs, all named Buddy, carried on until 1956 as the organization's roving ambassador: establishing criteria for students, securing suitable dogs, and finding capable instructors. Frank settled into his own Morristown insurance business, remaining active in Seeing Eye affairs until his death in 1980. In 1965, The Seeing Eye began construction of a new sixty-acre campus with administrative offices, student residence, veterinary clinic and kennels on Washington Valley Road in Morristown. Two years later, another sixteen-year-old lost accidentally lost his sight, this time in an at-home chemical explosion that also removed much of his right hand. The young man trained with his first Seeing Eye guide dog, a German Shepherd, at the end of his freshman year in college, in 1970. He went on to earn an undergraduate degree in psychology and an Master of Science, then a Ph.D., in computer science, designing the first talking computer for his doctoral dissertation in 1974-76. Dr. James Kutsch taught computer science in West Virginia University, then served as an executive at AT&T and Convergys Corporation. In 1996, Kutsch was elected to the Board of Trustees at The Seeing Eye. He applied and was accepted for the position of President and CEO for the organization in 2006, and has served there since. "Dogs have been with me through all the exciting parts of life as well as the routine, mundane parts, as I went through college and graduated, then through my whole working life," Dr. Kutsch remembers. "They were with me in the delivery room when my kids were born, during professional accomplishments, and on business trips. Last month I was in France with my current dog, Colby, a male yellow lab. They've been on rides in amusement parks, camping, on vacations, nearly every hour of every day." The Seeing Eye has created more than 15,500 partnerships between individuals and dogs, and Jim Kutsch is one of about 1,700 current Seeing Eye dog users in the United States and Canada. Successful first-time applicants enroll in a 25-day course at the Morristown facility where they are first matched with a guide dog. This is a two-way street; each guide dog must spend nearly every waking moment in the company of a certain human, not your normal pet situation. "Many people incorrectly think that a blind person comes through the door and we open the next kennel door and say Ôthis dog is yours'", explains Kutsch. "Each dog has a personality, an important factor, because people are widely different. We match the right dog with the right person. The dog I had in college was get up and go, ready to manage the crowds, much different than the dog I had as an executive where my day was spent in very lengthy meetings or traveling to new cities and hotels on business. Matching is both a science and an art, although some characteristics are obvious, like preferred walking speed or body size. Some like more of a defined pull in the harness. Others are very comfortable following a dog that's guiding, obviously, but not with such force. Figuring compatible lifestyles is more difficult." Dog lineage has come a long way from the days of peasant sheepherders. Today's Seeing Eye leads research in canine genetics, breeding, disease control and behavior. At the 330-acre Breeding Center in Chester, built in 2001, infant German Shepherds, Labrador Retrievers, Golden Retrievers and Lab/Golden, better known as puppies, spend their first eight weeks, having emerged from a pairing calculated by a computer information system that evaluates the suitability of every dog in the colony to become a breeder. Although the puppies are assured of all the right DNA to produce the brains and brawn required for an exciting career as a Seeing Eye dog, they are not guaranteed success. Only two out of three dogs complete the rigorous training required to assume responsibilities of such high consequence. Before taking on such painstaking instruction, even the smartest puppy has a long way to go, just as we wouldn't send a six-year-old genius to college. Successful candidates need to be emotionally and mentally mature, with enough life experience not to be intimidated the first time a fire truck goes racing by with the sirens screaming. For the next formative steps in a guide dog's youth, The Seeing Eye relies on a network of Puppy Raisers throughout New Jersey and eastern Pennsylvania who participate in a program that began in 1942 as a joint effort with 4-H Youth Development. Applicants attend local club meetings and study a manual while awaiting their pups, who arrive at the age of about eight weeks and stay until they are 14-18 months old. During that time, the youngsters learn about the human universe and the ins-and-outs of relating with people. "Puppy raisers give the dog a world view that helps the dog understand that it's fun to go places, that it's exciting," explains Dr. Kutsch. "A dog that's only seen the kitchen and the backyard is not going to do very well when it's time to negotiate Times Square or ride a subway. Our puppy raisers clearly care for the dogs and teach them to go out and be adventurous, explore the world. We are profoundly grateful, we need them and value them, and they are extremely important in the success of the entire program." Bob McCabe's puppy, Hunter, with his new trainer on graduation day. Seeing Eye puppies can be addictive; some have raised more than fifty. Bob McCabe has raised two and assisted with thirty-four. "One time, twenty-two families came to the Warren County Puppy Club, but only two took dogs. So I followed up and found out that most had the same objection. They didn't want to commit for a year-and-a-half in case they had to travel, or something came up. So I decided to stop raising puppies and start a "Puppy Camp" as their safety valve. With that option in place, fifteen more families signed up." McCabe has taken his dogs on road trip organized by the Seeing Eye, or on his own: walks at the mall, on trains and the subway, even on board planes at the airport. Every August, the Seeing Eye holds a picnic for all the puppy raisers, but the only dogs there are those with blind people. " We walk around the campus and see venues that show how trainers put the dogs through their paces. I listened to an eleven-year-old girl ask a trainer if there is one thing that a raiser could do to give you a better puppy to train. He said 'Just love your puppy, hug it once a day, and the love will be transferred to the trainer, and then to the blind person'"
When the time comes, the dog returns to the kennel for a short period of adjustment and a health check before assignment to a professional instructor for a four-month course of training. At the conclusion of the training, puppy raisers are invited to watch their dog walk through town with the instructor. When the dog is matched with a person, puppy raisers are told in which state or country the dog will reside and a little information about its person. If the puppy is not able to complete the training, raisers have the option to adopt the dog as a family pet. If not, The Seeing Eye will choose from a long waiting list of families looking to adopt a dog. Others maintain their roles as service dogs with law enforcement agencies. 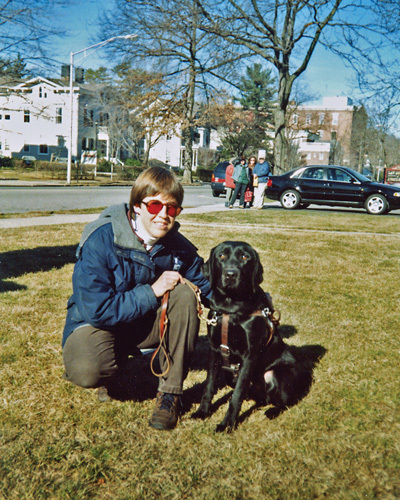 The best way to learn about how a Seeing Eye dog learns its business is to attend look for a walking tour with Jim Kutsch, sponsored by the Morris County Tourism Bureau, each year. "Downtown Morristown is our classroom," says Jim. "You see our dogs with trainers and later with blind students." The tour starts at the training center on Maple Avenue where students go for lessons. Instructors bring four dogs at a time to a climate-controlled area in the basement where three will wait while the other takes a lesson. The tour proceeds from there along DeHart Street to the corner of South Street, explaining more about teaching and the audible pedestrian crossing signals in town, stopping at Morris Frank's former insurance office at Park Place, before concluding at the statue of Frank and Buddy on the green. For walking tour dates and reservations, call 973/631-5151 or check here. 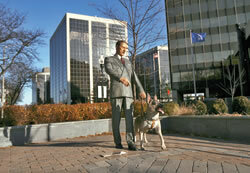 The Seeing Eye employs 177 full-time equivalent staff, including 42 instructors/ trainers. It costs $67,000 to create each partnership, for which the organization charges $150 tuition for first-time students, including the dog, instruction, transportation, room, board, equipment and follow-up. In a blind person's life there is a succession of dogs, each one retiring at about ten years of age. There is no public funding the Seeing Eye is supported by contributions from individuals, foundations, corporations, and bequests and other planned gifts. It seems that with all the advances in robotics, geographic data collection, and computerized sensory input that have advanced to the point that guide dogs could be replaced by mechanical devices using haptic feedback and audible signals. There is even an automobile that can drive itself successfully through all the hazards of a busy highway or city street. Jim Kutsch answers, "Advances in technology are great. They offer the promise of lots of things—one of those may someday be a robotic guide. As a technologist, I learned a long time ago never to say never. However, I do not see it being anytime in the near future that guide dogs will be replaced with an equally reliable, equally accurate technology that's generally available worldwide to the public at a reasonable price point. Further, not everyone is competent with operating and maintaining their technology (consider how many VCRs flashed 12:00 for years because the owner didn't know how to set the time). Sometimes even if outstanding technology is available, a 'low tech' or 'no tech' solution is preferable. People do not have the same bond with technology as they do with their dogs." You'll find plentiful information on the Seeing Eye's website or Facebook page. Or read the puppy raising blog, which documents the experience of raising a puppy. View historic buildings, elegant bridges, a chain of beautiful man-made lakes, lush meadows, woodlands. waterfalls and ornamental fountains at the historic estate. 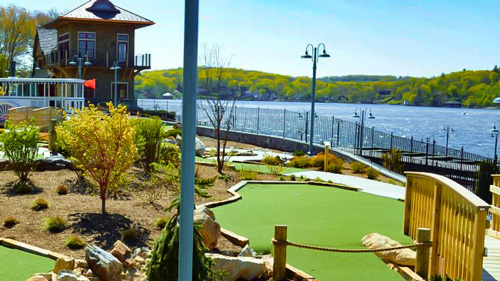 Putt through Lake Hopatcong history at this lakeside minigolf course. Perfect for your next party! 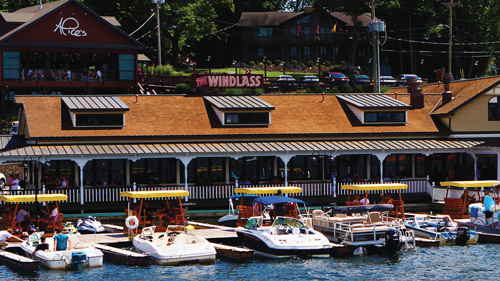 Enjoy dockside Italian fare at this lake icon completely renovated for your dining pleasure.